Time saver: I still don’t know how to pronounce “tuiles” properly. If you know what a tuile is then you already know these are delicious. If you don’t, then they’re a little difficult to explain, except to say that they’re thin, slightly crispy, slightly chewy, often curved dessert cookies. When they come out of the oven they’re quite malleable, so are sometimes shaped into bowls for ice cream etc. I haven’t internalised the recipe for these, or come up with my own particular spin on it. When I make these, I refer to Chef Eddy, who’s got a great recipe for Almond Tuiles on his site. The one thing I did do was halve the recipe, but I don’t think that really warrants me writing it up here. (Unless someone requests it.) So go on, go follow Chef Eddy’s advice and make them. They’re really pretty easy. Here’s a recipe I’ve been meaning to put up for a while, it goes out to my brother, who’s going to cook them for Mum when he gets back home (it’s on the Internet now, he has to). “Fish cakes” don’t sound all that appealing (to me anyway) but these are truly delicious. When you get them right, the outside slightly caramelised, the inside still moist and tender, the dressing fresh and zingy… everything just combines into something so much better than the name might suggest. Not only that but they’re really quick to make. I’ve tried a few variations of these, but this recipe contains the bare essentials required to guarantee success. The recipe calls for fresh coriander (cilantro), or basil if you don’t like coriander. If you don’t like either of those, I don’t know what you’re doing reading a food blog (unless you’re researching the enemy…) but I suppose you could use fresh parsley. Note the “optional” ingredients – these can be included for more flavour, but aren’t strictly required – you’ll still get an excellent result with just the base ingredients. Divide evenly between two plates. Combine chilli sauce and lemon/lime juice in a small bowl and mix well. Taste it, and if it’s too tart and 1 Tbsp brown sugar, then mix well. Add the chopped coriander and stir through. Combine all of the ingredients for the fish cakes in a food processor, and pulse till well mixed. Don’t go so far as to turn it into a paste, it should really only take 15-20 seconds. If you don’t have a food processor or anything like it, you’ll have your work cut out for you. Just chop everything finely, cut the fish into small (tiny) pieces, and then mix it by hand in a bowl. Heat the peanut oil in a frying pan over a medium-high heat. I normally use a non-stick pan for these, if you’re careful a bare metal pan will work too. Take a heaped tablespoon of fish mixture and shape into a flat round in your hand, then add it to the pan and repeat (quickly). You should get around 8-10 fish cakes. Fry fish cakes on each side for around 3-5 minutes, turning once the bottoms are golden brown and/or start to caramelise. Divide fish cakes onto the plated salad, placing them in a line down the middle of each plate, tiled slightly with the edge of one fish cake on top of the one next to it. 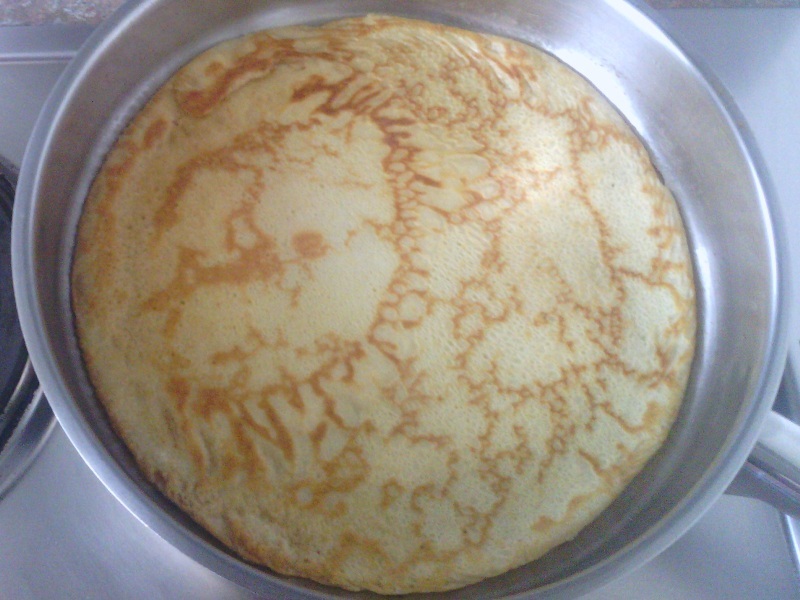 Crêpes are a traditional thin French pancake. They’re very versatile, and can be filled with just about anything for a variety of different effects. You can make them ahead of time and stack them up, or serve them hot out of the pan (my preference). For that reason, I’ve always been pretty familiar with crêpes, so I was a bit surprised to find that some people consider them tricky to make. The recipe itself is very straightforward and requires relatively few ingredients and not much skill to prepare. There’s a bit of a knack to getting the batter to spread while you’re cooking them, but once you get the hang of it and get used to the idea that the first crêpe is always going to be a disaster, they’re really pretty easy. Add the eggs and milk, then beat with an electric beater till smooth. If you don’t have an electric beater, you can use a whisk or wooden spoon and a bit of arm power. In that case, you’ll want to add the milk gradually as you mix to help you avoid lumps (with the electric beater these really aren’t much of a problem). Add the melted butter and mix to combine. This is optional, particularly if you use a bit of butter to fry the pancakes in, and my parents never added it. I’m a fan of butter, and it improves the taste a bit. Put the bowl of batter in the fridge to chill for an hour (or more). This stops the crêpes from shrinking when you cook them. You can prepare the batter up to a day before you actually want to use it. If you’re in a big hurry (e.g. my parents cooking Sunday lunch) you can skip this step and cook the batter immediately, but the pancakes will contract as they cook and be slightly thicker than they otherwise would be. Take the batter out of the fridge and give it a stir. If it’s too thick add another splash of milk and stir it through. Pour some of the batter into the pan. I use a ladle that holds 1/3 of a cup, you could also use a 1/3 cup measure, or just pour it out of the bowl (you get a feel for how much you need). Don’t pour it directly into the middle – pour to one of the sides as it makes it much easier to spread. After adding the batter to the pan quickly lift it and tilt the pan around to spread the batter evenly. If the pan is too cold, the batter will slip and be hard to spread. If the pan is too hot the batter will cook too quickly, before you’re able to spread it. If the batter is too thick it will also be hard to spread (in that case add a bit more milk to the bowl of batter and stir it through). If you’ve used too much butter to grease the pan it will run up the sides and onto the top of the pancake – although that’s not really a problem because it just makes the edges a delicious crispy golden brown. Don’t worry if the first one turns out wrong or doesn’t spread evenly. This is your chance to thin the batter, adjust how much butter you’re using to grease the pan, or adjust the heat of the element. Cook on that side for around 1-2 minutes until the top is no longer wet. If you lift the pan and shake it slightly, the pancake should slide around. At that point, flip the pancake using a fish slice (wide spatula). If your pan has curved sides you can flip the pancake just by rapidly lifting the pan and moving it forward, up and then back towards you. It takes a bit of practice but is achievable. Cook on the remaining side for another 30-60 seconds. At this point you can serve immediately, or stack on a plate in a warm oven (90°C/200°F) to serve in one go. 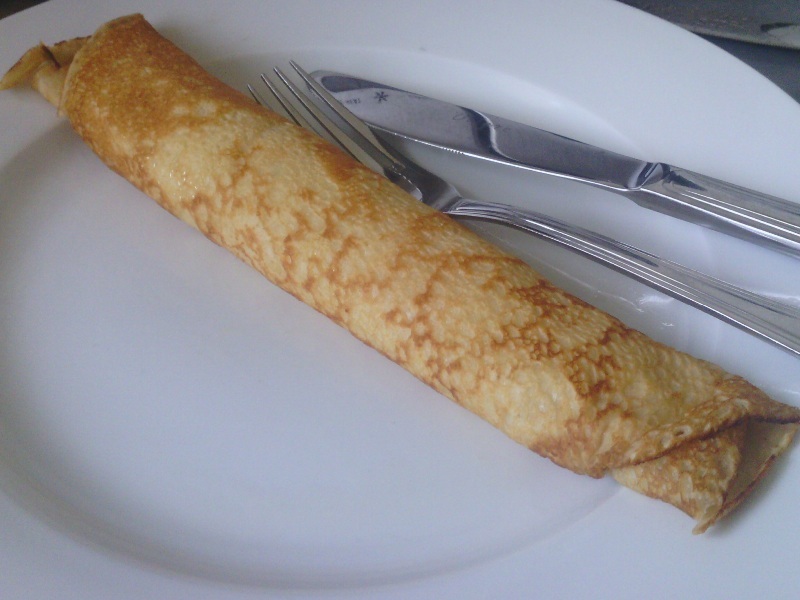 I’d then eat the crêpes, sprinkling some sugar (2-3 tsp) and a dash of lemon juice (1-2 tsp), then rolling them up tightly. Alternatively, use maple or vanilla syrup, a fresh fruit compote, vanilla ice cream etc. You can also fill them with savoury fillings, or roll them up and bake them like enchiladas. Time saver: Phil sells out to the marketing shills and cooks a roast. So today (Sunday 7 August 2011) is Selaks NZ roast day. Why we need a wine company to tell us to make roasts is a bit beyond me, but hey. I’ve been meaning to do make roast beef with yorkshire pudding for quite a while, so I’ll jump on the gravy train (sorry) and do it today. I don’t know enough about roasting beef to go offering advice to anyone (though you’re welcome to share yours with me!) so there won’t be recipe for this one. As it was, I was too busy carving and serving to take any photos at the time we ate, but I went back and plated up some leftovers. Note the complete absence of yorkshire pudding. As per Dad’s style, I cooked them in a muffin tray, making 12 small puddings. And yes, we ate them all before I got around to getting the camera out. 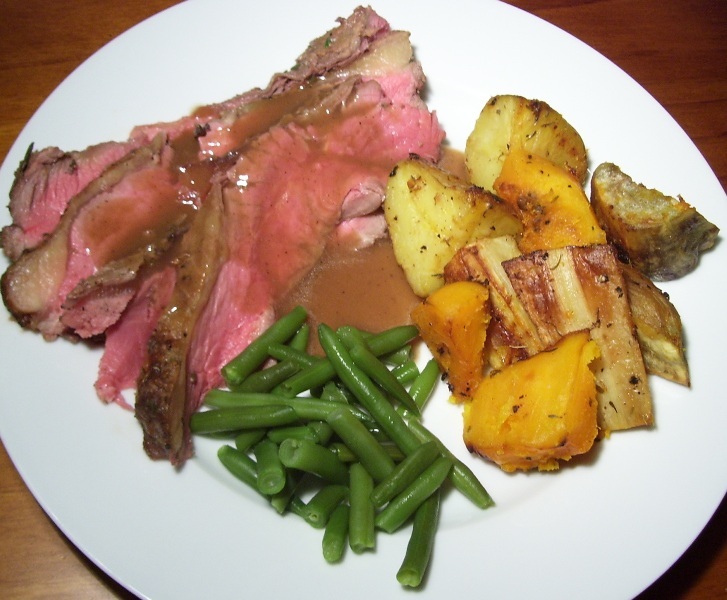 I cooked a sirloin roast, using this recipe from the NZ Beef & Lamb website as the base. As per Jamie Oliver’s instructions for consistently good gravy I put the whole thing on a vegetable trivet while roasting in the oven. It must have worked, because the gravy was fantastic. For the veges I just chopped up 3 potatoes, about a quarter of a pumpkin, a large kumara and a couple of parsnips. Put it all in a roasting dish, then covered in olive oil, mixed in a little garlic and thyme and then seasoned with salt and pepper. Roasted at 200°C for about 45 minutes. 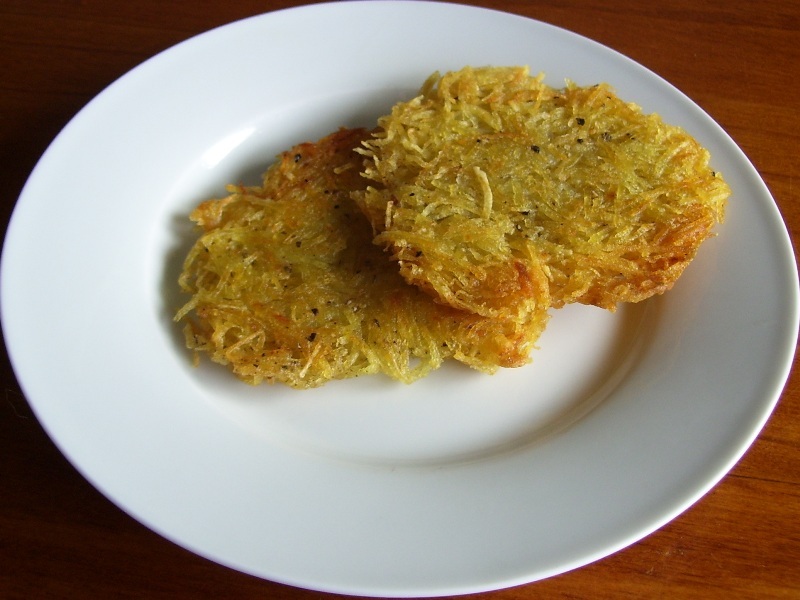 There’s two basic types of hash brown – the pure hash brown and the embellished one. The first is simply grated potato, seasoned with salt and pepper, fried in a little oil. The second might contain eggs (which help hold everything together), onions, garlic, bacon etc. This post is all about the pure version. Put grated potato in a colander, press firmly to squeeze out moisture. Leave for 20 minutes or so, then squeeze again. A variation on this is to also sprinkle a little salt in after the first squeeze to help draw out more moisture. As per the colander, but use a metal sieve (just be careful not to break it – you really do have to push quite hard to get that moisture out). You can try using paper towels to blot off the moisture, or wrap around some of the grated potato and squeeze it out. Note that you’ll probably have to use a lot of paper towels to do this properly. If you have an extremely clean tea towel handy you can pile the grated potato into the middle, fold the towel around it lengthwise, then twist it thoroughly, wringing the moisture out of the potato. Or let your imagination take flight (and let me know in the comments what you do!). Clean and dry the potatoes. You can peel them, but I leave the skins on (since that’s where the nutrients are). Remove any obvious blemishes, eyes, shoots etc. Grate the potatoes into a large bowl. Pick one of the moisture extraction techniques listed above and get as much moisture out of the grated potato as possible. Season the potatoes with freshly ground black pepper, and stir it through. Scoop the grated potato into a ¼ cup measure and press it in firmly, then tip into the frying pan. (You can just spoon the potato into the pan, but using the ¼ cup measure ensures even sized hash browns and helps keep the potato together. For a bigger hash brown use a bigger measure.) Press the hash brown down with the back of a spoon, spreading the potato out and getting to about ½ – 1 cm thick. Try and keep the edges together (the grated potato tends to stray outwards). After pressing it flat, sprinkle/grind a little salt over it. You’ll probably fit about 3 or 4 hash browns in the pan at a time (unless it’s a big pan). Fry the hash brown for around 3-4 minutes, then flip and fry for around 3-4 minutes on the other side. If the oil has all been absorbed you can add a little more just prior to flipping. The exact cooking time will obviously depend on your element, frying pan, potato, oil etc. Ideally the hashbrowns should be golden-brown (without going actual brown), and need to be cooked all the way through. Serve and eat while hot.